Related: Are We 100% Sure Taylor Swift And Karlie Kloss Aren’t Twins? At first I looked at it, and I was all, "DANG THEY LOOK FLY AF," but upon closer inspection, I realized something even more incredible: Taylor and Karlie have successfully embodied one of humanity's most famous and beloved emojis, the dancing twins. Karlie said it herself in the caption. #CONFIRMED. 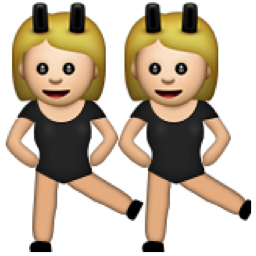 They're both in black leotard-esque clothing (admittedly a little more risqué than the emoji version, but whatever). If they ever decided to be this for Halloween, they would barely need to dress up. And since we know Apple is already preparing a middle finger for our iPhones, they might as well throw in some T-Swift and K-squared emojis while they're at it, right? Right.